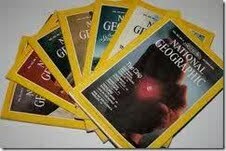 I still remember the smell of the National Geographic magazines in my grandfather's home. I believe he had collected decades worth of reading material. We were encouraged to read them and learn about the world. I fully understand PTB's obsession for Le Monde but I always remind her that she can't only receive her news from 1 source. There are other highly respected source of news analysis.